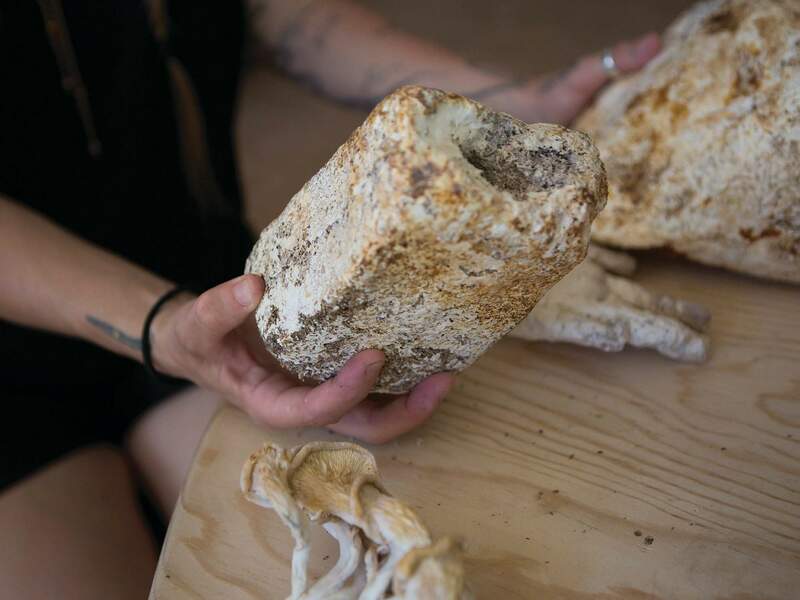 Kaitlin Bryson holds a mycelium brick, which is used to strip heavy metals and toxins from soil and water. Bryson and other activists hope to use bricks or smaller beads like this to remove chemicals from water and land surrounding the Los Alamos National Lab in New Mexico. SANTA FE (AP) – Water conservationists and a Native American women’s advocacy group believe they’ve found a potential solution to a massive, decades-old underground plume of toxic chromium that likely has spread from property owned by Los Alamos National Laboratory to San Ildefonso Pueblo land. The key ingredient? Mushrooms. They want the lab to give their fungi-based idea a try. At an upcoming meeting, the nonprofit Tewa Women United and Communities for Clean Water will try to convince lab officials to start a pilot project to test whether a bioremediation technique based on mushrooms could help decontaminate the aquifer of hexavalent chromium that lab workers over several decades dumped into a canyon from cooling towers at an old power plant. It may sound far-fetched, but advocates say the technique, called mycoremediation, could be healthier for the environment and less costly than efforts the lab is currently using to treat contaminated water pumped out of the plume. The lab is testing other remediation methods as well, such as pumping molasses and bacteria into the plume to convert the highly carcinogenic chromium-6 to chromium-3, which is far less toxic. “Conventional remediation strategies are inherently harmful to a very fragile ecosystem,” said Kaitlin Bryson, an Albuquerque-based artist and organic farmer who is helping spearhead the mycoremediation proposal. Bryson, 30, said the idea is in its infancy, and she’s not sure exactly how many mushrooms it would take to completely restore the aquifer. “I really can’t conceptualize,” she said. The group plans to pitch the idea during a public hearing in Los Alamos in early November on a state discharge permit for the lab. The groups contend the permit was approved three years ago without public input. “It’s really not a crazy concept,” said Peter McCoy, a Portland, Oregon-based mycologist, a scientist who studies fungus, who is helping Bryson with the proposal. McCoy has experimented with mushrooms for about 17 years and has been leading smaller-scale mycoremediation projects for four years. The results can be significant, he said. The technique uses mycelium, the vegetative body of a fungus, which acts as a magnet to extract heavy metals from soil and water. The first step is to grow molds in a material such as agar, a jelly-like substance found in some types of seaweed. The substance is then inoculated with mycelium and grows. The end result is a mycelial “brick” or “bead,” which is used to strip away toxic materials, advocates say. The method has been used to break down diesel fuel, harmful bacteria and even diapers, according to studies by Paul Stamets, a mycologist who has secured an Environmental Protection Agency contract to research mycoremediation. The strategy also has been used in the Ecuadorian Amazon, where Chevron is accused of dumping billions of gallons of oil-drilling waste into unlined pits. McCoy sees the chromium plume project as an opportunity to advance the science. “If we are able to move forward, this would be a great proving ground for this technology,” he said. “It’s really a no-brainer,” Bryson said. She led a mycoremediation workshop in April and again earlier this month at the Regeneration Fest: Youth Water Protectors Gathering in Española, where participants explored ways to care for their communities, land and water. She hopes to hold similar workshops in the future. Bryson envisions a community remediation effort in which homemade mycelial bricks or beads are placed at a contamination site as part of an art-like installation. The proposed pilot project would require lab equipment to extract chromium-tainted water from the ground. Organizers say it also would need funding, the support of a scientific community and volunteer power. That research is used to determine a final cleanup approach, Horak said. He could not provide further comment. For indigenous groups, pitching mycoremediation to the lab is part of a larger effort to get their voices heard. “We’ve earned a right to have a say in how we manage this place,” said Beata Tsosie-Pena of Santa Clara Pueblo, the environmental justice program coordinator for Tewa Women United. The purpose of the public hearing in November, she said, is to address a lab discharge permit for groundwater tests and well development that was issued by the state Environment Department in July 2015 without any say from members of the community. Horak confirmed the November meeting will be the first public hearing on the permit. Such decisions affect local people, Tsosie-Pena said. She believes the time to act is now. “It’s at a turning point where we have to take a hard stance on not letting this continue in our backyards, in our watersheds,” Tsosie-Pena said.